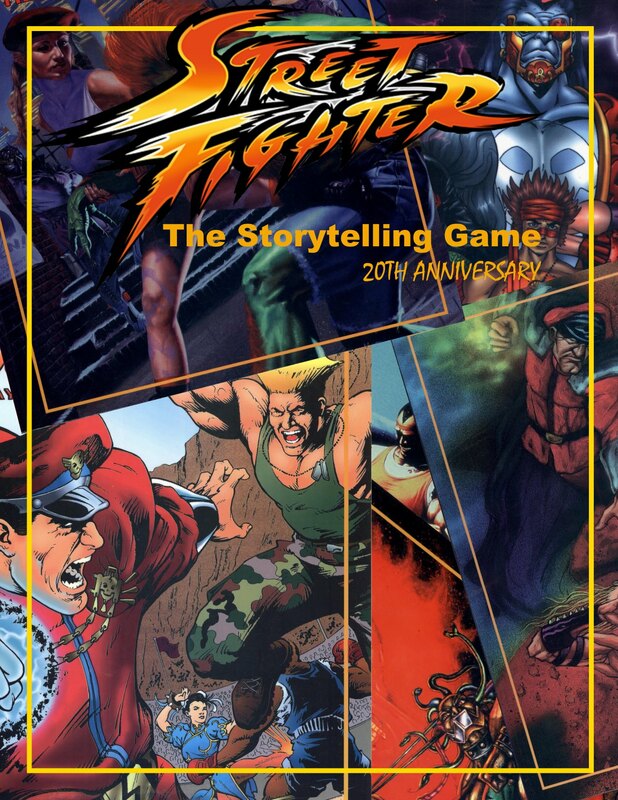 Street Fighter: The Storytelling Game 20th Anniversary Edition! 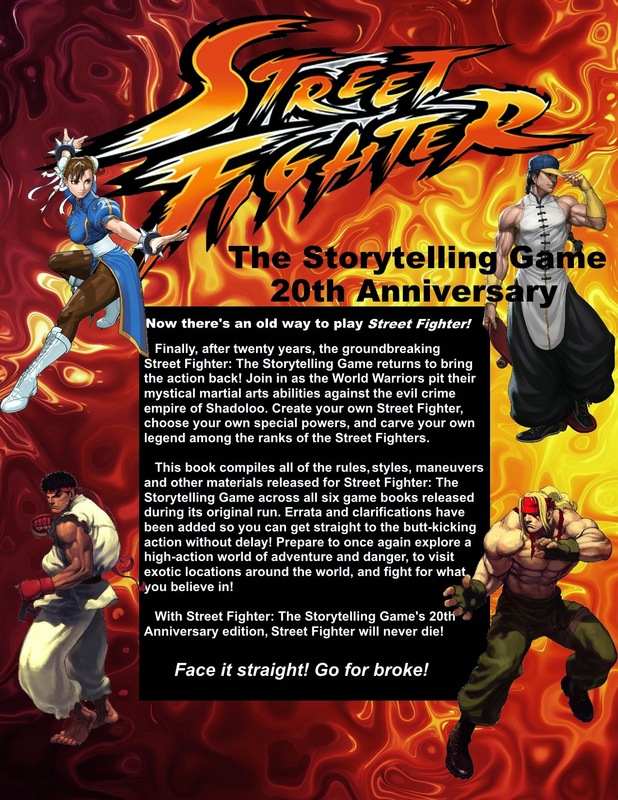 Street Fighter the Storytelling Game will soon have its own fan-made 20th anniversary edition! I spoke with the creator recently, and I’m told that it will be a compilation of all the the materials from the current source books into one beautifully formatted electronic document. No longer will you have to flip through different books to see all the moves or styles etc. They will all be organized together by chapter. You can follow along with the progress and updates here and get a pretty good idea of what the final product will look like from the work-in-progress pdf files. There are some inconsistencies and contradictions in the original White Wolf print versions that were never corrected in any kind of second edition or errata. This means some judgement calls will be made in order to compile it all in a consistent way. For the sake of preservation however these will all be transparent if you want to make your own call instead. The end of 2014 is coming up fast so it’s a bit of a race against the clock to be released on the 20th anniversary. I’m definitely rooting for him and you should too! Absolutely. To the point that he’s in my credits now, just for inspiration. Also that guy only lives about an hour away from me so we’re probably going to play at some point. Hey Sensei, does this inspire you to complete the G-File? I think that’d be a great companion to this thing! Boy oh boy is Duncan about to be in for a surprise! I haven’t heard a thing lately from the guy doing it. Any news on the anniversary book? I have been a fan of the RPG since It came out, my friends and I played it for years and I have just introduced it to my little brothers. I think this one will be different! While I would certainly like to see this it’s hard to have much hope. As usually happens with these fan projects, there’s a mass of activity and posts at first (as happened here), then silence (nothing in almost a month now), and the project fades into obscurity with no one confirming or denying anything (fully what I expect to happen here). I hope I’m wrong but I doubt it. It’s a sad fact that Real Life kills most fan projects; look at the charcter stat block/martial arts pdf – starts off strong, then dead. very much looking forward to this, the years have not been kind to my books.